Sometimes changing your computer mouse can be uncomfortable for a while until you get used to the replacement. It may also take some time to get used to new features or the lack of features the new mouse has. [Jon] bought an awesome wireless mouse that he really likes but it is missing one critical feature: rapid fire for gaming. He previously modded his old wired mouse to have a rapid fire button using a 555 timer. That worked fine as the mouse ran off the USB’s 5 volts, and that’s the voltage the 555 timer needed. The new wireless mouse has a 1.5 volt battery and can not support the 555 timer. What’s a gamer to do? [Jon] searched around the ‘net but could not find any wireless rapid fire mods. Eventually, he did find a low-voltage variation called the LMC555 and ordered a few for his project. The new wireless mouse was taken apart in order to find out how the mouse buttons work. In this case, the signal pin is pulled low when the mouse button is pushed. Now that it is known how the mouse button works, just a couple of resistors, a capacitor, an NPN transistor and a push button switch are all that are necessary to finish up this mod. When the push button is pressed, the LMC555 timer activates the transistor in order to ground the mouse button signal pin. This happens to the tune of 1236 times a minute! That is a lot of rapid firing. The few components were soldered up neatly and packed into the limited spare area inside the mouse. A hole drilled in the side of the mouse’s housing holds the new rapid fire push button in an ergonomically pleasing location. Earlier, we mentioned [Jon] has done this mod before on a wired mouse. He learned about that project here on Hackaday. Check it out if your wired mouse is craving a rapid fire button. [Gabe’s] been wanting to do some embedded development for years, and his other hobby of playing paintball recently provided him with a test project. He’s been working on a custom driver board for his paintball gun. Don’t be confused by the name, GCode is a mash-up of his name and the fact that he wrote the code for the project. It has nothing to do with the G Code CNC language. At first this might seem like a trivial hack, but this Viking paintball gun has some serious velocity and throughput so he needs a reliable control that won’t just start shooting randomly. Another thing that [Gabe] took into consideration was monitoring the loading process to make sure the paintball is full seated before firing. All of this is handled by that tiny little Femtoduino board. it interfaces with the guns hardware using the connector board mounted above it. There are several videos sprinkled throughout the build log. But we found the officially sanctioned 12.5 balls per second mode and the ridiculously fast auto-fire clips the most interesting. It should come in handy when on the run from paintball shotgun wielding opponents. This wiring nightmare lets [H. Smeitink] map all the buttons from an Xbox 360 controller to his PC. It gives him the ability to push control input from his PC to the console. But it goes a step further than that because it actually acts as a pass-through device. He connected a wired controller to the computer and uses a program he wrote to translate those inputs and send them to the hacked controller. The software is written in C#. It’s got a recording function that lets him save the keypress data from the wired controller while it’s sent to the Xbox in real time. When he finds a combination that he uses frequently he plucks out those commands, sets them up as a macro, and assigns one of the buttons to execute it. The controller hack uses one transistor for each button, and a PIC 18F4550 which controls them and provides USB connectivity with the PC. This isn’t one nice package like some integrated rapid-fire and macro solutions we’ve seen. But it certainly opens up a lot more possibilities. See for yourself in the clip after the break. [Shawn McCombs] has been spending some time refining his Xbox 360 rapid fire hack. This time around he’s got a lot more features, many of which we haven’t really seen before. When we looked at the original project he had added an ATtiny85 which read a potentiometer to set the rapid fire speed for one of the buttons. This time around he’s opened up settings for individual weapons in the game. For instance, if you have a hand-gun and a rifle, you can set different rapid fire rates for each to account for the reload speed for those guns. He patched into the ring of LEDs on the controller in order to indicate which preset is currently chosen. There are three tactile switches on the underside of the controller too. One of them is a reset button which gets you back to your primary weapon and the default rapid fire rate. Settings for each weapon are saved to the EEPROM so you won’t lose them when the controller goes to sleep. Check out [Shawn’s] description of the project in the video after the break. 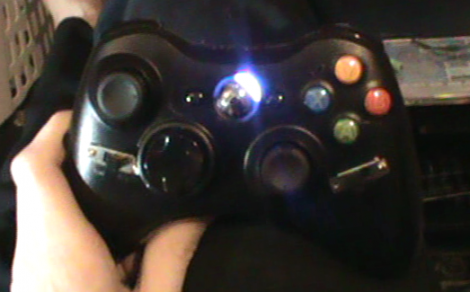 [Shawn] sent in his fully adjustable auto-fire mod for an XBox360 controller. It’s pretty simple – just an ATtiny85 soldered to a button with a pot to adjust the rate and switch to turn it on and off. It could have been done with a 555, but this is good enough. [Capt-Nemo] loves and tolerates everyone so he modded his 60 Gig PS3 with a bunch of LEDs to display Rainbow Dash’s cutie mark. Yes, it’s from My Little Pony. Don’t judge us. Watch the demo video instead. How do you organize resistors? A while ago we saw a neat way to store resistors in a piece of foam with a grid according to the first and third color bands. [Greg] did it another way that just puts a label on a piece of foam. Can you think of a better way? It’s not a synthesizer, but is it fake? A lot of people have been sending in this video of [Stephen] turning his kitchen into a synthesizer. We’re thinking he turned a bunch of bowls and cans into an MPC / MIDI controller at best, or it was all done in post. We’ll let our readers duke it out in the comments. A gracious Hack a Day reader sent in a mechanical television demo he found during late night intertube browsing. We know it’s from a 1992 episode of Computer Club that aired in Germany. It’s four rotating bars of 232 LEDs that will display a standard TV signal. We think it might be time for an RGB LED version of this. Any takers? 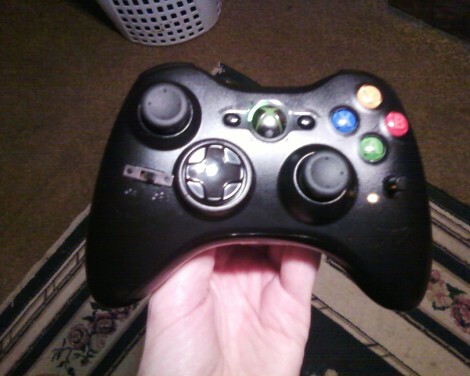 [Shawn] wrote in to share his post outlining the addition of rapid fire to an Xbox 360 controller. He’s going all out with this mod by including a pretty beefy microcontroller. But you get a lot of functionality for that. You can just make out the trimpot below and to the right of the green A button. This tweaks the speed at which your right trigger repeats. Next to the trimmer is an amber LED which indicates whether the hack is enabled or not. The switch to the left of the D-pad simply patches the add-on circuit into the right trigger hardware. Some might raise an eyebrow when we call the ATtiny85 used here beefy. 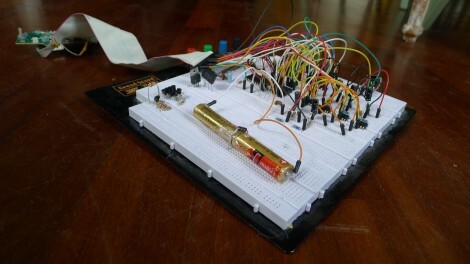 But considering the job at hand, we’re sure a lot of the lower end of the ATtiny family will work just as well. [Shawn] soldered everything up on a piece of protoboard and removed one of the rumble motors to make room inside the controller. The video after the break is pretty shaky and out of focus, but you can clearly hear him explain how the hack works.